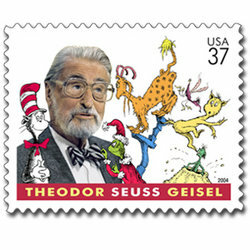 Dr. Seuss is the pen name of Theodor Seuss Geisel (March 2, 1904 – September 24, 1991). He was a famous American writer and cartoonist best known for his children's books. Geisel was born in Springfield, Massachusetts. He graduated from Dartmouth College in 1925, where he was a member of Sigma Phi Epsilon, the Casque & Gauntlet Society, and wrote for the Jack-O-Lantern humor magazine under his own name and the penname "Seuss." He entered Lincoln College, Oxford, intending to earn a doctorate in literature. At Oxford, however, he met Helen Palmer, married her in 1927, and returned to the United States. He began submitting humorous articles and illustrations to Judge (a humor magazine), The Saturday Evening Post, Life, Vanity Fair, and Liberty. One notable "Technocracy Number" made fun of Technocracy, Inc. and featured satirical rhymes at the expense of Frederick Soddy. He became nationally famous from his advertisements for Flit, a common insecticide at the time. His slogan, "Quick, Henry, the Flit!" became a popular catchphrase. Geisel supported himself and his wife through the Great Depression by drawing advertising for General Electric, NBC, Standard Oil, and many other companies. He also wrote and drew a short lived comic strip called Hejji in 1935. Even at this early stage, Geisel had started using the pen name "Dr. Seuss". His first work signed as "Dr. Seuss" appeared six months into his work for Judge. Seuss was his mother's maiden name; as an immigrant from Germany, she would have pronounced it more or less as "zoice", but today it is universally pronounced in Americanized form, with an initial s sound and rhyming with "juice". The "Dr." is an acknowledgment of his father's unfulfilled hopes that Seuss would earn a doctorate at Oxford. Geisel also used the pen name Theo. LeSieg (Geisel spelled backwards) for books he wrote but others illustrated. In 1936, while Seuss sailed again to Europe, the rhythm of the ship's engines inspired the poem that became his first book, And to Think That I Saw It on Mulberry Street. Seuss wrote three more children's books before World War II (see list of works below), two of which are, atypically for him, in prose. As World War II began, Dr. Seuss turned to political cartoons, drawing over 400 in two years. Dr. Seuss's political cartoons opposed the viciousness of Hitler and Mussolini; some depict Japanese Americans as traitors. One such cartoon appeared days before the internments started. In 1942, Dr. Seuss turned his energies to direct support of the US government's war effort. First, he worked drawing posters for the Treasury Department and the War Production Board. Then, in 1943, he joined the Army and was sent to Frank Capra's Signal Corps Unit in Hollywood, where he wrote films for the United States Armed Forces, including "Your Job in Germany," a 1945 propaganda film about peace in Europe after World War II, "Design for Death," a study of Japanese culture that won the Academy Award for Best Documentary in 1948, and the Private Snafu series of army training films. While in the Army, he was awarded the Legion of Merit. Dr. Seuss's non-military films from around this time were also well-received; Gerald McBoing-Boing won the Academy Award for Best Short Subject (Animated) in 1951. Despite his numerous awards, Dr. Seuss never won the Caldecott Medal nor the Newbery. Three of his titles were chosen as Caldecott runners-up (now referred to as Caldecott Honor books): McElligot's Pool (1947), Bartholomew and the Oobleck (1949), and If I Ran the Zoo (1950). After the war, Dr. Seuss and his wife moved to La Jolla, California, a small community forming part of San Diego. Returning to children's books, he wrote what many consider to be his finest works, including such favorites as If I Ran the Zoo, (1950), Scrambled Eggs Super! (1953), On Beyond Zebra! (1955), If I Ran the Circus (1956), and How the Grinch Stole Christmas! (1957). At the same time, an important development occurred that influenced much of Seuss's later work. In May 1954, Life magazine published a report on illiteracy among school children, which concluded that children were not learning to read because their books were boring. Accordingly, Seuss's publisher made up a list of 400 words he felt were important and asked Dr. Seuss to cut the list to 250 words and write a book using only those words. Nine months later, Seuss, using 220 of the words given to him, completed The Cat in the Hat. This book was a tour de force—it retained the drawing style, verse rhythms, and all the imaginative power of Seuss's earlier works, but because of its simplified vocabulary could be read by beginning readers. In 1960, Bennett Cerf bet Dr. Seuss $50 that he couldn't write an entire book using only fifty words. The result was Green Eggs and Ham. Curiously, Cerf never paid him the $50. These books achieved significant international success and remain very popular. Dr. Seuss went on to write many other children's books, both in his new simplified-vocabulary manner (sold as "Beginner Books") and in his older, more elaborate style. The Beginner Books were not easy for Seuss, and reportedly he labored for months crafting them. At various times Seuss also wrote books for adults that used the same style of verse and pictures: The Seven Lady Godivas, Oh, The Places You'll Go!, and his final book You're Only Old Once, a satire of hospitals and the geriatric lifestyle. Following a very difficult illness, Helen Palmer Geisel committed suicide on October 23, 1967. Seuss married Audrey Stone Diamond on June 21, 1968. Seuss himself died, following several years of illness, in La Jolla, California on September 24, 1991. Dr. Seuss did not like publicity. This may have been due to his German ancestry; as a schoolboy during World War I, his classmates used to nickname him "The Kaiser". Seuss generally maintained this meter quite strictly, up to late in his career, when he was no longer able to maintain strict rhythm in all lines. The consistency of his meter was one of his hallmarks; the many imitators and parodists of Seuss are often unable to write in strict anapestic tetrameter, or unaware that they should, and thus sound clumsy in comparison with the original. An example is the title (and first line) of One Fish, Two Fish, Red Fish, Blue Fish. The formula for trochaic meter permits the final weak position in the line to be omitted, which facilitates the construction of rhymes. In Green Eggs and Ham, Sam-I-Am generally speaks in trochees, and the exasperated character he proselytizes replies in iambs. While most of Seuss's books are either uniformly anapestic or iambic-trochaic, a few mix triple and double rhythms. Thus, for instance, Happy Birthday to You is generally written in anapestic tetrameter, but breaks into iambo-trochaic meter for the "Dr. Derring's singing herrings" and "Who-Bubs" episodes. Seuss's earlier artwork often employed the shaded texture of pencil drawings or watercolors, but in children's books of the postwar period he generally employed the starker medium of pen and ink, normally using just black, white, and one or two colors. Later books such as The Lorax used more colors, not necessarily to better effect. Seuss's figures are often somewhat rounded and droopy. This is true, for instance, of the faces of the Grinch and of the Cat in the Hat. It is also true of virtually all buildings and machinery that Seuss drew: although these objects abound in straight lines in real life, Seuss carefully avoided straight lines in drawing them. For buildings, this could be accomplished in part through choice of architecture. For machines, Seuss simply distorted reality; for example, If I Ran the Circus includes a droopy hoisting crane and a droopy steam calliope. Seuss evidently enjoyed drawing architecturally elaborate objects. His endlessly varied (but never rectilinear) palaces, ramps, platforms, and free-standing stairways are among his most evocative creations. Seuss also drew elaborate imaginary machines, of which the Audio-Telly-O-Tally-O-Count, from Dr. Seuss's Sleep Book, is one example. Seuss also liked drawing outlandish arrangements of feathers or fur, for example, the 500th hat of Bartholemew Cubbins, the tail of Gertrude McFuzz, and the pet for girls who like to brush and comb, in One Fish, Two Fish, Red Fish, Blue Fish. Seuss's images often convey motion vividly. He was fond of a sort of "voilà" gesture, in which the hand flips outward, spreading the fingers slightly backward with the thumb up; this is done by Ish, for instance, in One Fish, Two Fish when he creates fish (who perform the gesture themselves with their fins), in the introduction of the various acts of If I Ran the Circus, and in the introduction of the Little Cats in The Cat in the Hat Comes Back. Seuss also follows the cartoon tradition of showing motion with lines, for instance in the sweeping lines that accompany Sneelock's final dive in If I Ran the Circus. Cartoonist's lines are also used to illustrate the action of the senses (sight, smell, and hearing) in The Big Brag and even of thought, as in the moment when the Grinch conceives his awful idea. Seuss's early work in advertising and editorial cartooning produced sketches that received more perfect realization later on in the children's books. Often, the expressive use to which Seuss put an image later on was quite different from the original. The examples below are from the website of the Mandeville Special Collections Library of the University of California, San Diego. An editorial cartoon of July 16, 1941 depicts a whale resting on the top of a mountain, as a parody of American isolationists. This was later rendered (with no apparent political content) as the Wumbus of On Beyond Zebra (1955). Seussian whales (cheerful and balloon-shaped, with long eyelashes) also occur in McElligot's Pool, If I Ran the Circus, and other books. Another editorial cartoon from 1941 shows a long cow with many legs and udders, representing the conquered nations of Europe being milked by Adolf Hitler. This later became the Umbus of On Beyond Zebra. The tower of turtles in this editorial cartoon from 1941 prefigures a similar tower in Yertle the Turtle. Seuss's earliest elephants were for advertising and had somewhat wrinkly ears, much as real elephants do. With And to Think that I Saw it on Mulberry Street (1937) and Horton Hatches the Egg (1940), the ears became more stylized, somewhat like angel wings and thus appropriate to the saintly Horton. During World War II, the elephant image appeared as an emblem for India in four editorial cartoons. Horton and similar elephants appear frequently in the postwar children's books. While drawing advertisements for Flit, Seuss became adept at drawing insects with huge stingers, shaped like a gentle S-curve and with a sharp end that included a rearward-pointing barb on its lower side. Their facial expressions depict gleeful malevolence. These insects were later rendered in an editorial cartoon as a swarm of Allied aircraft (1942), and later still as the Sneedle of On Beyond Zebra..
From his work, it would appear that Dr. Seuss's political views were what 20th century Americans would call liberal. His early political cartoons show a passionate opposition to fascism, and he urged Americans to oppose it, both before and after the entry of the United States into World War II. Seuss's cartoons also called attention to the early stages of the Holocaust and denounced discrimination in America against black people and Jews. Seuss's harsh treatment of the Japanese and of Japanese Americans, mentioned above, has struck many readers as a strange moral blind spot in a generally idealistic man. Seuss moved to La Jolla, California in 1948, following his years living and working in Hollywood. A widely told story says that when he first went to register to vote in La Jolla, some Republican friends called him over to where they were registering voters, but Ted said, "You my friends are over there, but I am going over here [to the Democratic registration]." Geisel had since been a lifelong Democrat. Horton Hears a Who (1954), Horton, an open-minded elephant, finds evidence of a world beyond our familiar one. Like Galileo Galilei or Giordano Bruno, the authorities want to punish Horton and destroy the evidence of his discovery. Horton maintains, however, that "A person's a person no matter how small." Gertrude McFuzz, who lives right next door, admires Horton for his uniqueness but fears to approach him due to her despised one feather tail. Seuss comes out strongly in favor of intellectual freedom. The Sneetches and Other Stories (1961) written around the birth of the American Civil Rights Movement, this tale of identity politics concerns a huckster who exploits people who want to feel superior to others based on their ethnicity. The Lorax (1971), though told in full-tilt Seussian style, strikes many readers as fundamentally an environmentalist tract. It is the tale of a ruthless and greedy industrialist (the "Onceler") who so thoroughly destroys the local environment that he ultimately puts his own company out of business. The book is striking for being told from the viewpoint (generally bitter, self-hating, and remorseful) of the Onceler himself. In 1989, an effort was made by lumbering interests in Laytonville, California to have the book banned from local school libraries, on the grounds that it was unfair to the lumber industry. The Butter Battle Book (1984) written in Seuss's old age, is both a parody and denunciation of the nuclear arms race, emphasizing the reckless and self-destructive behavior of both sides. Seuss's personal values also are apparent in the much earlier How the Grinch Stole Christmas (1957), which can be taken (partly) as a polemic against materialism. The Grinch thinks he can steal Christmas from the Whos by stealing all the Christmas gifts and decorations, and attains a kind of enlightenment when the Whos prove him wrong. Shortly before the end of the Watergate scandal, Geisel also converted one of his famous children's books into a bold polemic. "Richard M. Nixon, Will You Please Go Now!" was published in major newspapers through the column of his friend Art Buchwald. Nine days later, Nixon went. For most of his career, Dr. Seuss was reluctant to have his characters marketed in contexts outside of his own books. However, he did allow a few animated cartoons, an art form in which he himself had gained experience during the Second World War. In 1966, Seuss authorized the eminent cartoon artist Chuck Jones, his friend and former colleague from the war, to make a cartoon version of How the Grinch Stole Christmas!. This cartoon was very faithful to the original book, and is considered a classic by many to this day. In 1971, a cartoon version of The Cat in the Hat was made as well, but it was considered less successful. Toward the end of his life, Seuss seems to have relaxed his policy, and several other cartoons and toys were made featuring his characters, usually the Cat in the Hat and the Grinch. When Seuss died of cancer at the age of 87 in 1991, his widow Audrey Geisel was placed in charge of all licensing matters. Since then, Audrey Geisel has become a controversial figure among many of Seuss's fans, seen as being far more liberal in permitting commercialization of her husband's characters and stories. She approved a live-action film version of "the Grinch" starring Jim Carrey, as well as a Seuss-themed Broadway musical called Seussical (both released in 2000). A live-action film based on The Cat in the Hat was released in 2003, featuring Mike Myers as the title character. Dr. Seuss' books and characters also now appear in an amusement park: the Seuss Landing 'island' at the Islands of Adventure theme park in Orlando, Florida. Product tie-ins (cereal boxes, and so on) have also been implemented. You're Only Old Once! : A Book for Obsolete Children New York: Random House, 1986.